How do you determine what is a sandwich? Now I have set some standards for what is a sandwich, but I also have been questioned numerous times whether things count as a sandwich…. 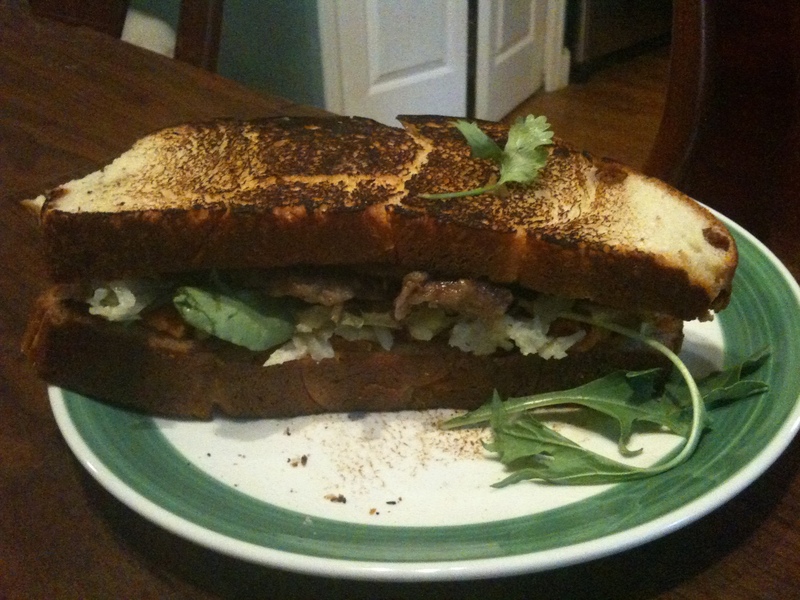 Everyone has their own idea of what a sandwich should be. If you watch the food network, you will see everything from a bite sized morsel to a pile of pig products on top of a loaf of bread. That is a pretty big range. I think a sandwich is whatever you want it to be. But I am not going to talk about the actual wedding, I am going to talk about the food… and the fact that the groom commented on the fact that I should be making a sandwich at his wedding. There has been rumor that the new bbq joint, Maverick’s Oak Pit Grill, in Golden was going to open, and finally they did. As with every restaurant, there are hits and misses, and there are the good and the bad. I had heard that the food was ok, and I also knew that the ventilation system was not quite set up. The bar and grill that used to be in the same location always smelled like a grease pit, so I wasn’t expecting much different from this place. Well, i found their website. http://mavericksoakpitgrill.com It says it is coming soon and says that they are in golden. There is an image, which is pretty advanced….. but of course there is no phone number. There is also no address, which is fine, because I know where it is. Anyway, I decided to go down there and see what they had for sandwiches…. I looked at their menu (which I would link if i could… but i can’t) and they had a couple of sandwiches. they are trying to get their liquor license, and they are trying to figure out the ventilation system. I had heard rumors about the quality of service and the quality of food, but I was the only one in there, so my view may be a little skewed…. i mean, they get negative points for not being able to add simple html text to their website with the phone number, but the menu looked good and things looked tasty. i went for a bbq tri tip sandwich on a garlic bread roll, with hand cut french fries. I left for about 10 minutes while my food was being prepared, and when I came back, they were just getting my order ready. Prices were not bad for a sandwich, and the portions were pretty good. They happily obliged to my request for extra terriyaki sauce on the side. It looked pretty tasty, and it was a pretty good size…. notice the hand in the background? That is one of my co-workers reaching for the terriyaki sauce. He ordered the same thing I did, and he also realized that there could have been more sauce on the sandwich. The flavor of the meat was good, the bread was toasted, but I couldn’t get any garlic flavor out of it, and I was always under the assumption that bbq was supposed to be messy no matter how you ate it. This was not the case at all. I appreciate that the bun was not soggy with bbq sauce, but there could have at least been a little more than what was on there! The fries were large cut, and were definitely fresh, but they didn’t seem to have enough seasoning. I ended up taking a couple of them, and as per my usual, putting them in the sandwich, and then pouring some of the terriyaki sauce on top to moisten up the whole thing. I wasn’t really blown away by any of the flavors, and i am curious to see what the oak pit seasoning will do for these guys? I guess I will have to wait and see. 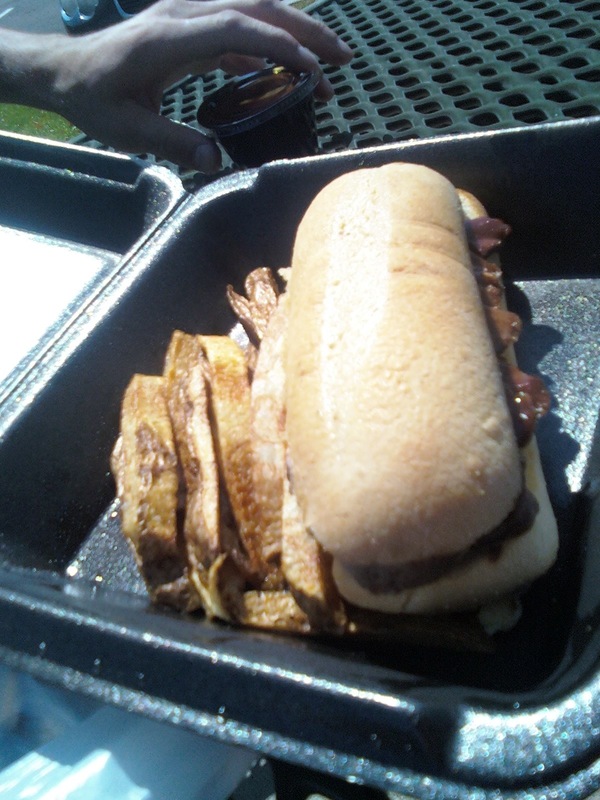 Overall, I gave the sandwich a 2.5/5 because the portions were decent, the fries were fresh, but there was no kick to the flavor, and the bread was sort of a slightly oversized hot dog bun. I think I will wait until they get their smoker up before I go back for more…. sorry. La Shana Tova to all. 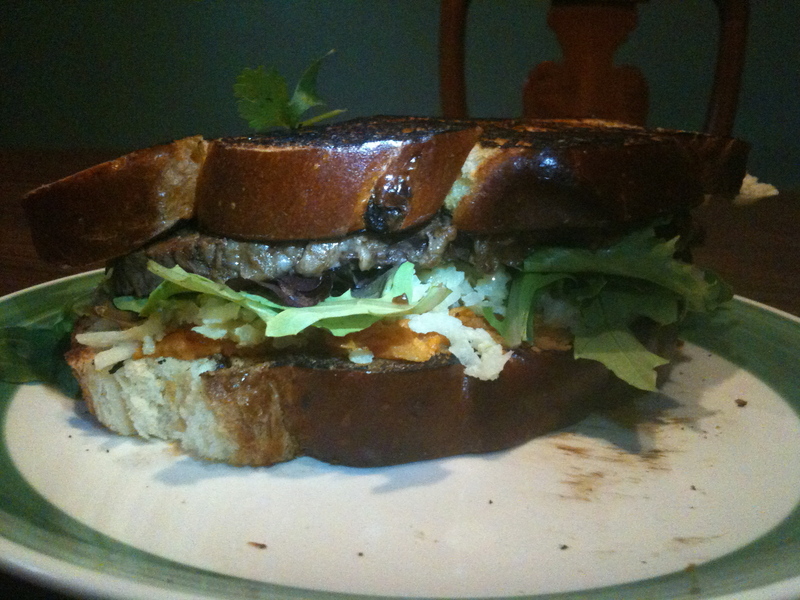 When most people think about Rosh Hashanah, they don’t think about sandwiches do they? I mean, what are your favorite traditional jewish foods? When you think about the jewish New Year, what foods come to mind? I think of the ones that my grandma still makes around this holiday for the brunch after services at the beachhouse. I think about the brisket, the kugel, the bagels and cream cheese, the sweet potatoes and honey, the apples and honey, the raisin challah in the round loaf… with a little bit of salt…. so good. I think about eating my way through the afternoon, and being full all through the night. Well, Emily and I hosted a Rosh Hashana Dinner the other day, and we had a lot of food… we had 2 types of kugel, a brisket, sweet potatoes, fresh-homemade tomato soup (with tomatos and basil from the garden), and plenty of challah. Apple pie for dessert, and we were good to go. I was sufficiently stuffed from all of this food… but really what I couldn’t wait for was the leftovers…. and the sandwiches to be made from said leftovers. My favorite part of thanksgiving is the turkey sandwiches after the meal, and one of my favorite parts of rosh hashanah is being able to reflect upon the year, notice the changes, and look forward to a sweet, happy, and healthy new year. i also like the sandwiches made out of leftovers. Step 1: Prepare the ingredients. Slice off a really big piece of raisin challah. Heat up the 3 pieces brisket with onions and apricot preserves, 2 sweet potato pieces and honey (total; 1/2 sweet potato); 1 piece potato kugel. Pull out some mixed greens. Step 2: Toast the bread: I probably should have put it in the toaster oven to give it a little more structure, but I pan toasted it in a cast iron skillet. The first 2 pieces I burned, but the second 2 were pretty good…. A touch of oil, but other than that, nothing else on them. Step 3: Start with the spreads: I put a couple of spoonfuls of apricot preserves on one side, and the sweet potatoes on the other side. spread the sweet potatoes pretty thin, but you want things to stick in there. Step 4: Start Layering: On the side with the apricot, I start laying out the brisket. You don’t want to overlap too much, but 3 pieces fit perfectly on the piece of challah that I sliced. After the brisket, I added the mixed greens, then a layer of honey, and then the potato kugel, which is separated and spread out so that it is even. This goes right against the sweet potatoes… If i had any of the tomato soup left, i might have put a little bit between the sweet potatoes and the kugel, but I didn’t, so there. Then…. you eat. 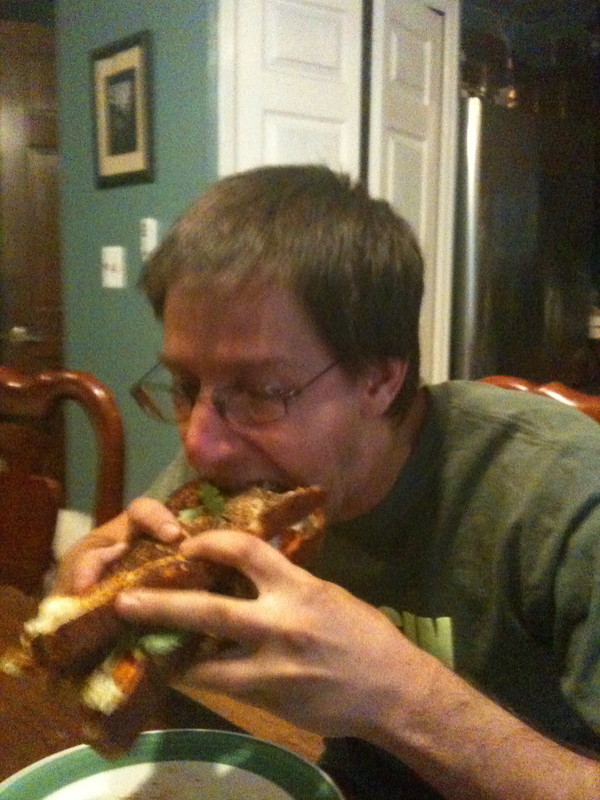 Because the bread wasn’t super firm, you needed to have a good grip on the sandwich. I probably could have cut it in half, but that seemed to take the fun out of it. It was tough to eat the whole sandwich in one sitting, given that it was basically a whole plate of food shoved into a sandwich…. my rating: **** only 4 because of the bread’s structural integrity.